This is where we begin. Where we start our training. Where we play, learn, grow. Where we fall in love with the idea of a life as an actor. This is our joy. It is the foundation of everything and without it, there is nothing. However… this is not in and of itself …enough. What is interesting is that this is where many actors live and unfortunately then many actors stop. It is very easy to spend a lifetime in class. In safety with people who love you. An artist must always keep training and working on their instrument, but we must also realize that we have to step outside our training comfort bubble and use our craft in the “real world” too. A common dream that actors often deeply wish for is that all they will have to do is just show up and act and then get rewarded with money and a career and all of the things that media portrays as going along with that. Unfortunately… The actual “Acting” part of an acting career is often a small percentage of where the work and effort happens. You will often hear people say “Just do great work and you will be successful”, but in reality… you can be the best actor on the planet, but if no body knows you exist, then they cannot hire you. This is where the other categories come in. It’s not “who ya know” but who knows YOU. Once your skill set is at a place that it can be seen, then it is time to get out there and connect. Most actors concentrate all the efforts in this area into getting and agent and getting in front of casting directors. But remember that although those positions are very important, there are many other players too! And sometimes your most valuable connection can be your fellow actor. So get out there and meet people. If you are shy, it doesn’t have to mean getting business cards at parties, it could mean you tweet someone a story that is relevant to them. There are a million different ways to connect. The important thing to remember is that you cannot do this career alone. This is often where actors fall short just because they “Don’t know what to do”. But not knowing how to do something is no reason not to do it. You just have to learn a new tool or skill! Remember that there was a time when you did not know how to read a scene or how to take your first headshots… but you learned how to do that and you can learn much more. When you are a beginner, marketing will consist of Headshot and Resume. You cannot do much without these basic staples. Even if you have no credits yet, you will still need to have a basic pic a resume. Please always remember that nobody is born knowing how to write a press release, how to create a great looking IMDb profile, or any other marketing goody. 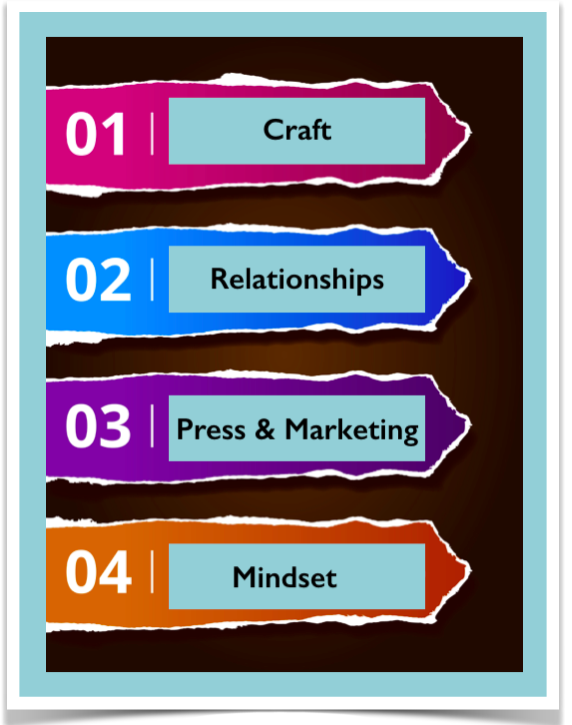 Marketing and press are learnable skills. And they require learning and taking actions … step by step. This is by FAR the most important part of an acting career. You can have all the talent, looks, money, & connections in the world, but if you do not have a healthy mindset, nothing else can help you. You might even make it big, but might be miserable when you get there. “I’m late because…” (This is a biggie in Los Angeles) – Honestly… unless you got in a car accident, are running from another audition, or there was an earthquake, the reason kind of doesn’t matter. The truth is that 99% of the time you are late, it is because you did not care enough to plan to be on time. There is also fear of success, fear of failure, playing the victim, laziness, blaming others, fear of rejection, etc… There are ton of ways actors get in their own way but when you learn to use your mind to your advantage, the world opens up to you. What we focus on expands… and it is vitally important to work on a positive successful mindset ABOVE ALL ELSE. Without a success mindset, stars sometimes get everything they thought they always wanted and then absolutely must destroy themselves with drugs, alcohol, getting in jail, etc… all because of what is going on in the inside. Yet I have also seen actors with minimal talent and skill and no money or connections, get to a place where everyone wants to hire them just because they are positive and hustle, and are great to be around. What is most important about this is that they are enjoying the journey. After all … isn’t that why we become actors in the first place? Acting makes us Happy! So to be a complete and balanced actor, try to do a little bit in each category every day of your life. It does not have to be huge… it is the consistency of action that is important. Get what I’m saying? Only took 20 minutes… I don’t care how busy you are, you can do that. Slow and steady wins the race. And if you really want success sooner than later…fast and steady wins the race even faster! So get out there and take ACTION!